She was sitting in the park reading a book when she noticed the young man staring at her from over the hedge. "What do you want?" she asked, almost rudely, annoyed at being distracted from Dr Ransom's encounter with the Hross. She thought vaguely that he looked rather familiar - probably someone she had met before, or someone from her library? "I was just passing by," he said. She gave him a flat stare, then turned back to her book. Minutes later, she lifted her eyes again. "Haven't you finished passing by yet?" she asked curtly. "Oh, I'm sorry," he shrugged politely. "But this is public property, isn't it?" "Didn't your mother ever tell you it's rude to stare?" "I do believe she did, but then again, who ever listens to their mothers nowadays?" She sighed in frustration, closing her book with a snap and shoving it into her sling bag. She had taken a few steps away from the bench when she felt a stinging in her bare arm. Twisting her head, she saw a small dart quivering on her right shoulder. "You shot me," she said with some surprise. "It's not poisoned is it?" she asked, her eyes wide. "Just a little tranquilizer," he answered, smiling. Her hand reached for the dart, her trembling fingers slipping as she tried to pull it out. "Let me help you," he said, stepping close to her. "Are you afraid of me?" "Shouldn't I be?" her fingers groped at it, trying to pull it out, but her vision was blurring and her hands couldn't find the strength. He caught her as she slumped to the ground. "Why would I poison you?" he asked her still form as he hefted her over his shoulder and carried her to his car. He sat her upright in the passenger seat and fastened her seat belt, gently leaning her lolling head against the headrest. He pulled out the dart and rubbed its tip on his pants before slipping it into his bag. A droplet of blood seeped out from her bare shoulder. He frowned at it, then searched for his handkerchief to wipe it off. He congratulated himself on a job well done - perfect marksmanship, if he could say so himself. The drive into the country was no lonelier than it had ever been, and he soon found himself talking to her sleeping form. "I hope I didn't use too much tranquilizer," he found himself apologizing. "It was pretty hard to estimate the quantity especially since you're such a small-sized girl. No hard feelings, eh?" he chuckled. "It was my special dart too - I'm always lucky with that one. I'm sure you'd appreciate that. It's just so hard to meet people nowadays. Nice people, I mean. Not the types that would want to lock you up in a room just as soon as you start talking. I hope you'll like where we're going." She stirred a little, the jolting of the car pulling her back into consciousness. He spared her a glance. "Just enough, I suppose," he said. "At any rate, we're here." He stopped the car in front of an old, ruined castle. She shook her head, trying to clear the grogginess, struggling against the lethargy in her muscles and bones. As soon as he parked and unlocked the central locking, she threw off the seat belt, flung open the car door and darted into the surrounding foliage. "I wish they wouldn't do that," he said, reaching into his pocket for the dart. "Now I'll have to start all over again. Cute story. Stopping by from A-Z sticking around to follow. It's impressive you're writing a story for every letter. It's squeezing a lot out of my brain, but totally worth it! You always offer a surprise. Gotta say you really rise to the challenge of AtoZ!!! Anna, you clearly have a flair for the offbeat and the macabre. Honestly, you might like some of Roger Corman's early films, like the gruesome but funny Bucket of Blood. Good Post and interesting story. Great read - thanks for sharing. 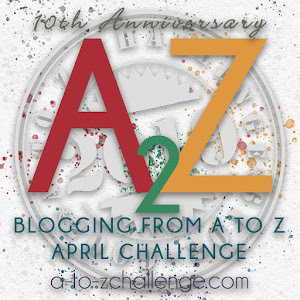 Looking forward to your next A to Z post! Love the back and forth, Anna!